Good quality pipettors designed for easy and precise pipetting. Pumps feature a lever for quick release, and forward or backward wheel movement. 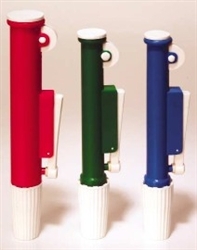 The soft elastic chuck has a threaded collar to tightly grip glass or plastic pipettes. Easy to clean.